Microsoft Office 2013 preview is available for download as trial version, but this trial version is of 60 days i.e. 2 months, which is enough for you to decide whether you want to buy the retail license or not. There are several new features in Office 2013, which includes optimization for touch-enabled PC. One of the most notable feature is sky drive integration with cloud syncing of documents so that you could resume your work from anywhere. 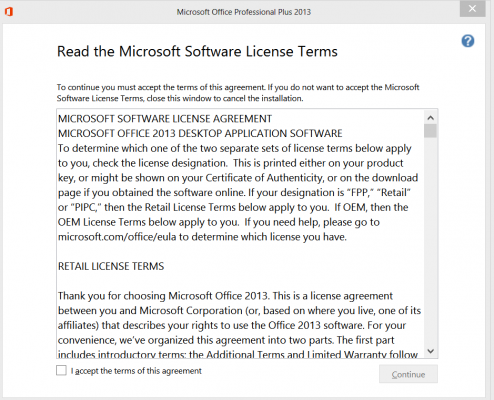 There are two types of licenses given for Office 2013. One is the conventional type i.e. license for use of single computer, other one is Office 365 which includes license for 1 year of the latest Microsoft Office for use on upto 5 computers. Requirements : You must have windows 7 or windows 8 operating system (or Windows Server 2008 R2, or Windows Server 2012). Minimum 1GB of RAM for 32-bit and 2GB for 64-bit office 2013 is also required. This means that Office 2013 is not supported/available for windows xp users. Get your 60-day trial version for Microsoft Office 2013 professional from here (you’ll get serial key for use for 60 days at the end of registration completion )or for Office 365 Home Premium from here .Download the most appropriate version matching your computer type i.e. x86(32-bit) or x64(64-bit). 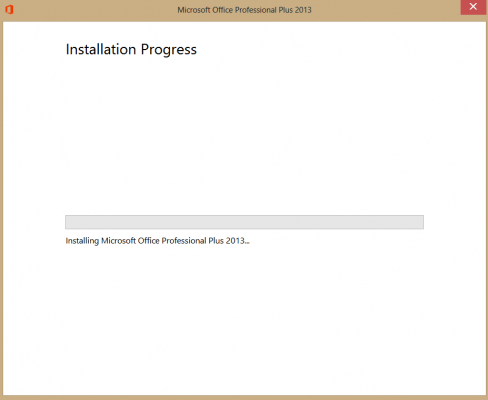 Now after signing up for trial version, Download Microsoft Office 2013 installation file. The installation file is of img format and is of 700-800mb file-size. On windows 8, just double click on the downloaded Office 2013 img file to mount it. On windows 7, you need to mount it using third-party software, or you may extract it using 7-zip program. Run setup.exe then. Accept Office 2013 license terms and hit on Continue button. Choose custom/advanced method of installation. Now, if you already have previous version of Microsoft Office installed, you’ll get option to remove the previous version or keep it and install the new version without removing the old ones. I’d rather prefer to remove the previous version and go ahead with installation of the current version. 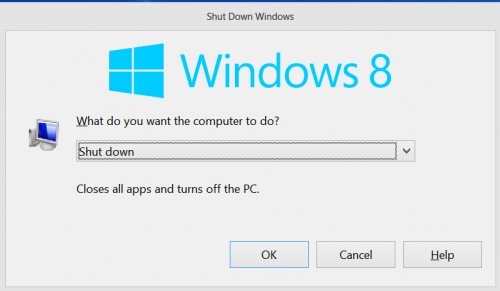 You may want to alter Hit on Install now after selecting the desired option. 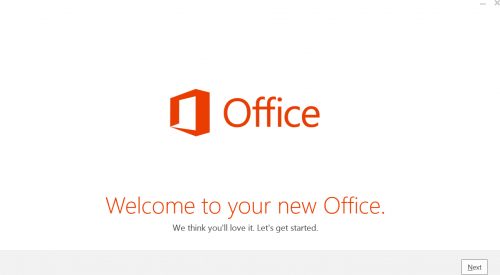 After successful installation, launch any MS office program i.e. Word. You can see how themed windows of Word 2013 is. It really looks catching and appealing. It’ll present you with easy to setup wizard. You’ll be asked to sign in with your Microsoft account. Make sure you’re connected to internet. You may skip this step if you desire so. On this step, it’ll introduce you to Skydrive and its features. 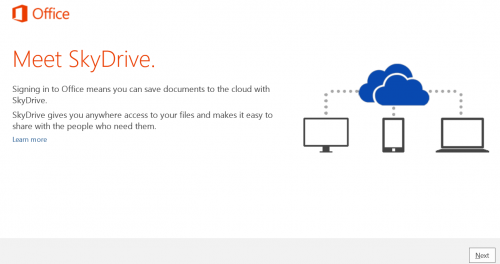 With skydrive, you can keep your documents directly on your skydrive storage so that you could work on your documents on any computer. Hit Next. All Done! The wizard has completed. Now word will be launched. Choose to create a blank document. You’ll see a highlighted ticker notifying you to activate your Office product. Hit on Activate button. 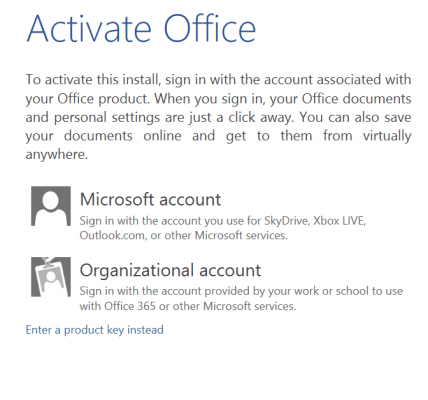 If you’re subscribed for Office 365, sign in with the account. If you’ve received a product key, you can enter product key by choosing the option Enter product key instead. As soon as you the product key, it’ll be instantly validated and Office will be successfully activated. 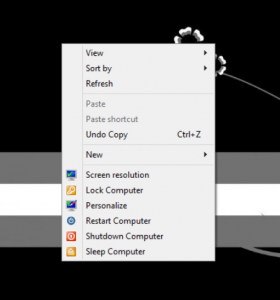 The author of this tutorial has himself tried and installed Office 2013. We’d soon come up with new features, tips and tutorials on Office 2013. Keep reading our blog for more awesome and useful guides. If you want us to write a tutorial on something, feel free to contact us.